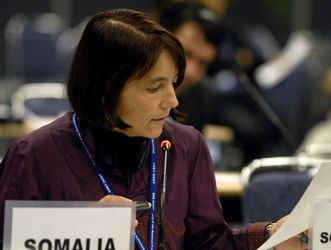 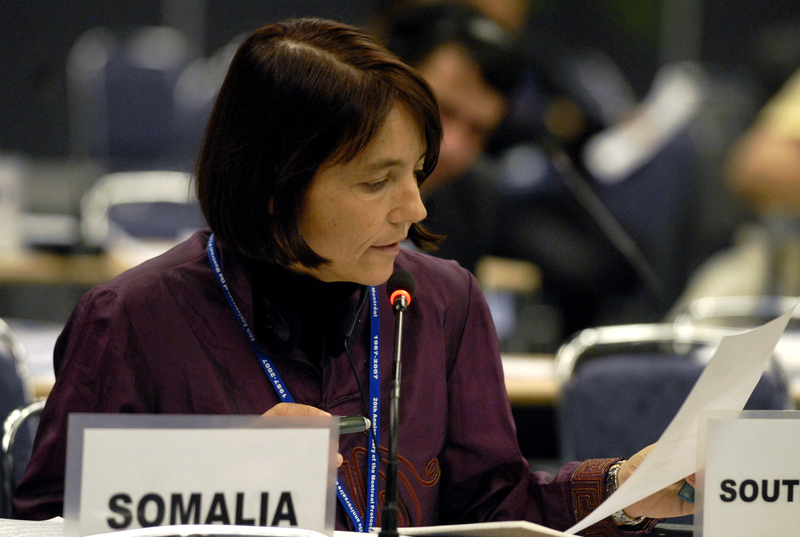 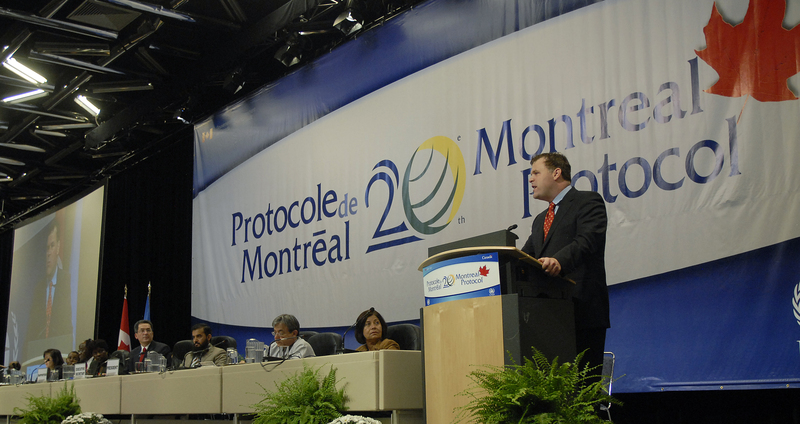 Summary report of the 20th Anniversary Seminar of the Montreal Protocol "Celebrating 20 years of Progress"
On Friday, delegates convened in preparatory and high-level sessions to conclude MOP-19's work. 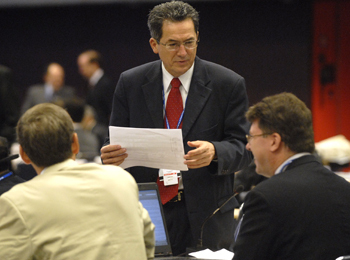 In the afternoon preparatory segment, delegates agreed to forward a range of draft decisions to the high-level segment, including draft decisions on the Terms of Reference for a study on the Multilateral Fund, and the Montreal Declaration. The HCFC contact group convened throughout the day and at 9.35pm reported back to plenary where delegates forwarded a landmark decision on accelerated HCFC phase-out to the high-level segment. 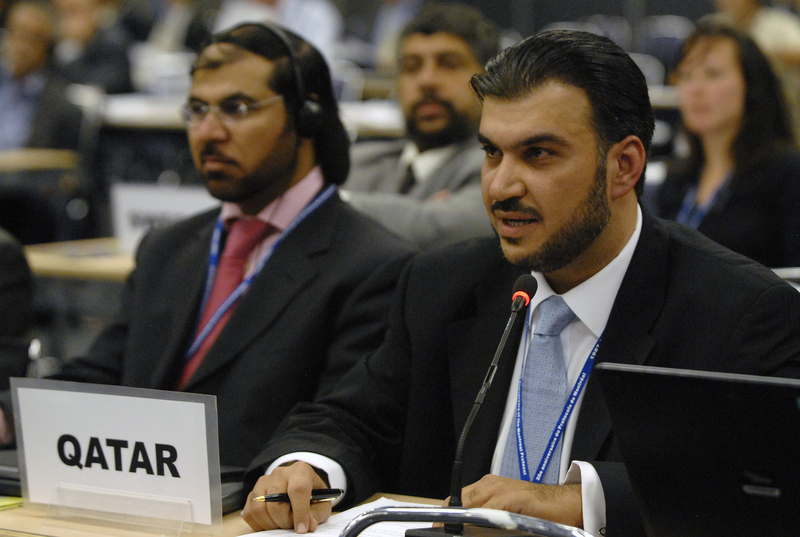 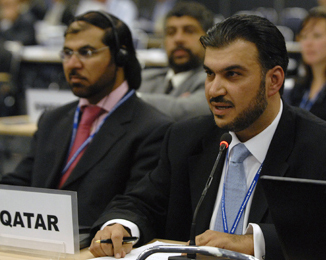 The high-level segment approved the related decisions and MOP-19 Bureau President Khalid Al-Ali thanked delegates and the Secretariat for their hard work, and Canada for hosting the meeting. 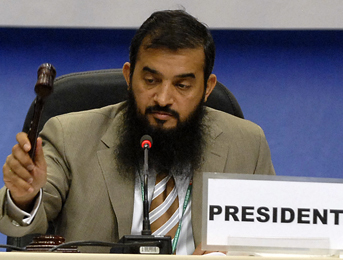 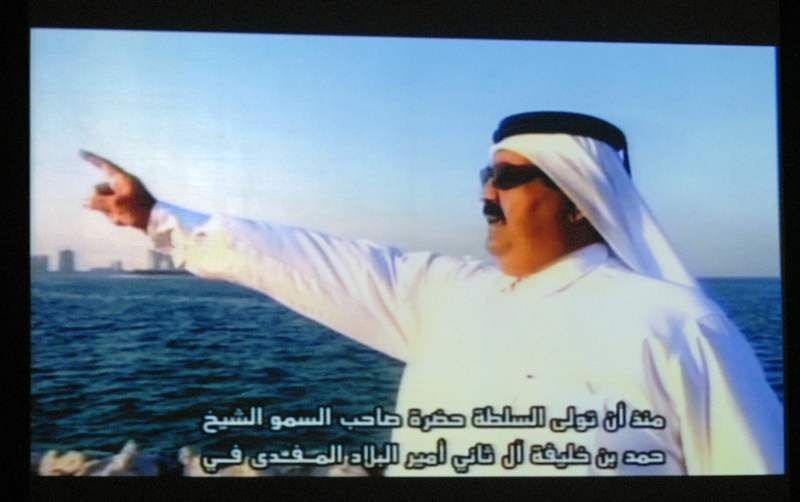 He announced that the next MOP will be held in Doha, Qatar, and gaveled the meeting to a close at 10.54 pm. 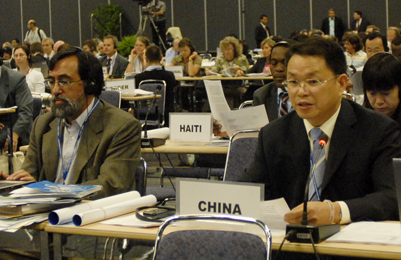 Esteban Vega Ugalde, Ecuador (left), stressed the need for sustained funding to accelerate HCFC phase-out. W.L. 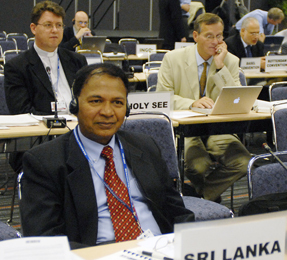 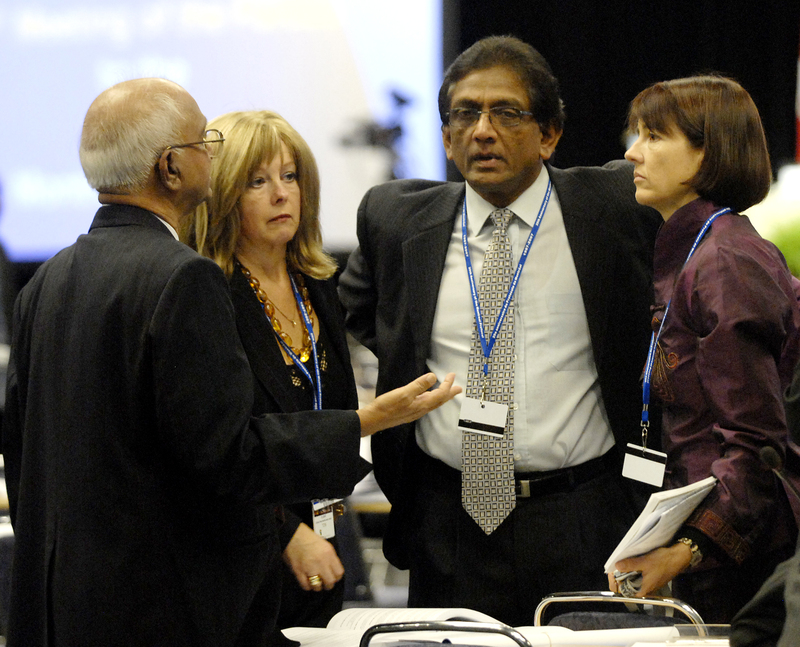 Sumathipala, Sri Lanka (right), highlighted the need for viable alternatives to meet the challenge of HCFC phase-out. 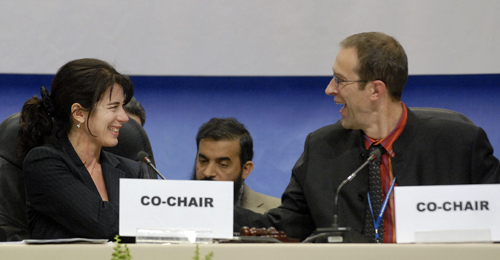 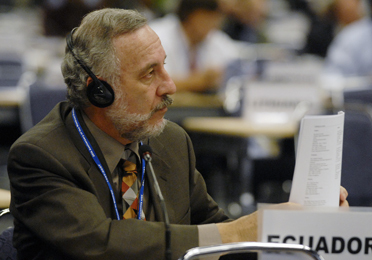 David Kantor, Greenpeace, called on parties to ensure that HCFCs are not replaced by hydrofluorocarbons (HFCs) with high global warming potential. 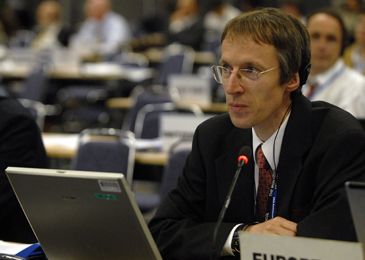 Didier Coulomb, International Institute of Refrigeration, emphasized that environmentally-friendly refrigerants have been developed. 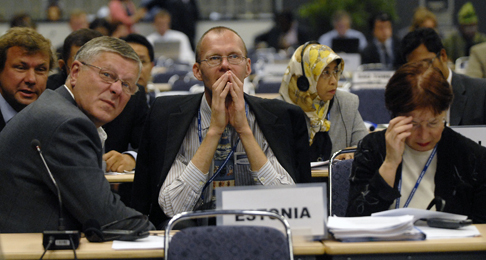 He stressed that any decision on refrigerants should differentiate between industrial and non-industrialized countries and that cooperation and funding are vital to transfer technologies. 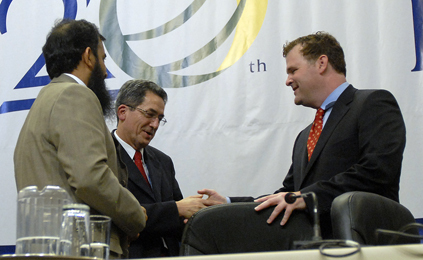 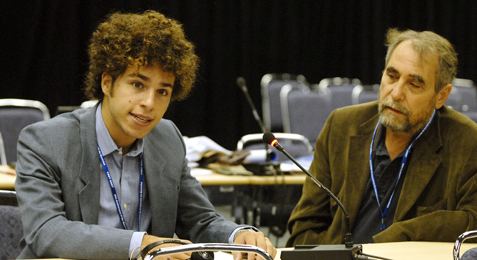 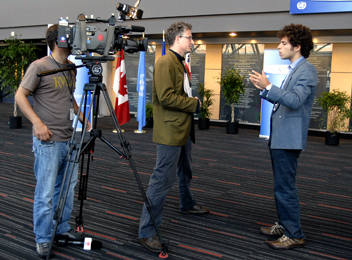 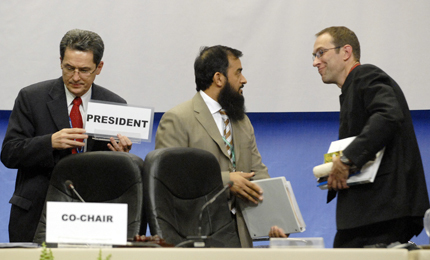 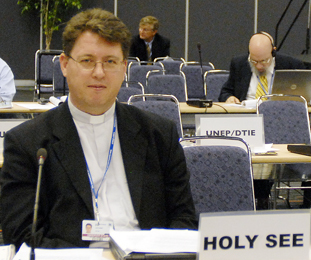 Luca Lorusso, Holy See (left), presented a statement by Pope Benedict XVI to the delegates at MOP-19. 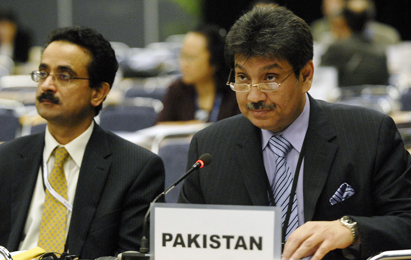 Makhdoom Syed Faisal Saleh Hayat. 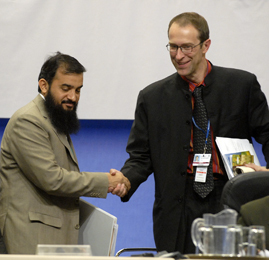 Pakistan (right), supported increased multilateral funding to transform industries to ozone friendly technologies and alternatives. 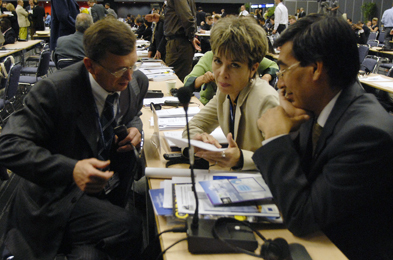 Judy Beaumont, South Africa (left), presents the draft decision on eligibility of South Africa for financial assistance from the Multilateral Fund. 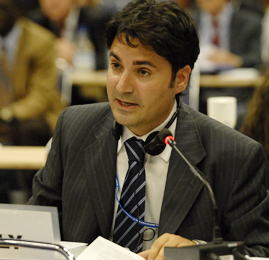 Alessandro Guiliano-Peru, Italy, reported on the results of the budget contact group. 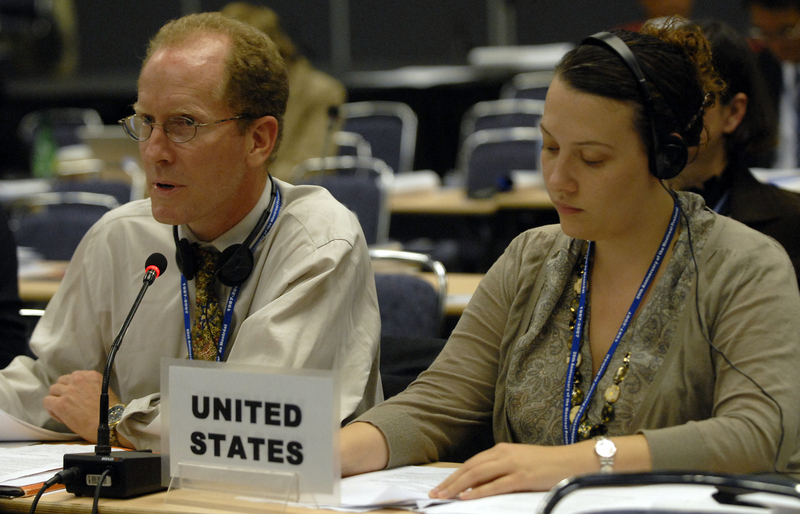 Tom Land, US, said he was gratified by the efficiency of the Secretariat and said that the leadership of Pierre Pinault and the goodwill of the group contact group enabled the merging of the US and EU proposals and resulted in reaching agreement. 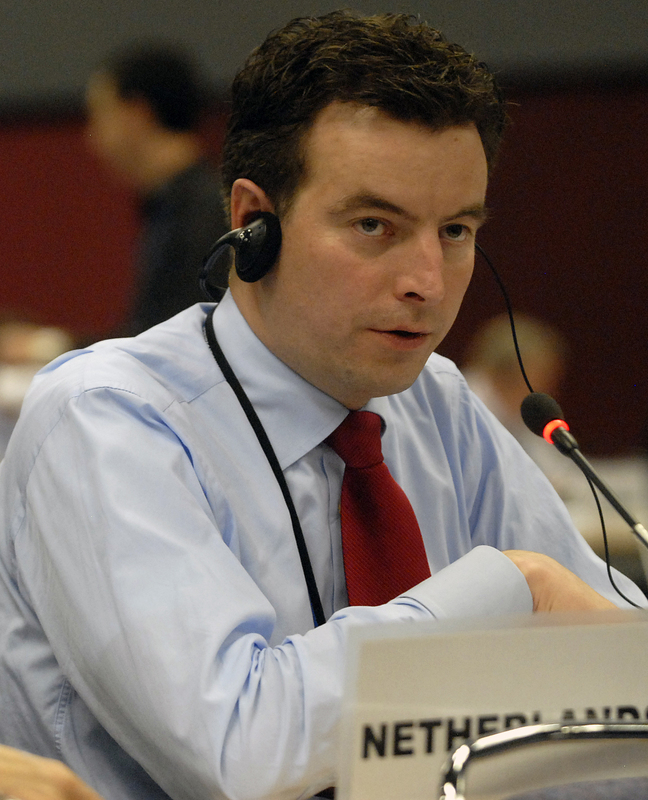 Marcus Wandinger, European Commission, said that he appreciates the work of the MBTOC,and the group followed their recommendations. Maas Goote, HCFC Contact Group Co-Chair (left), presents the draft decision on HCFC adjustments to the Preparatory Segment; China (right) said they had "complex emotions" regarding the HCFC adjustment, stressing the importance of this achievement while expressing concern about the significant effectsi it will have on their economy. 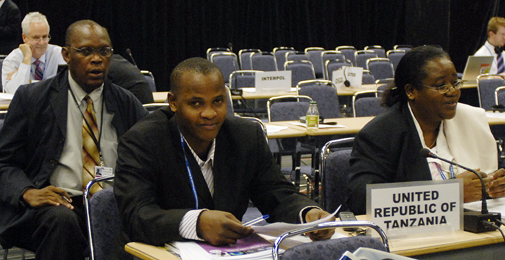 The Russian Federation (above) emphasized his desire for compromise and constructive cooperation on the HCFC phase-out, and congratulated delegates. 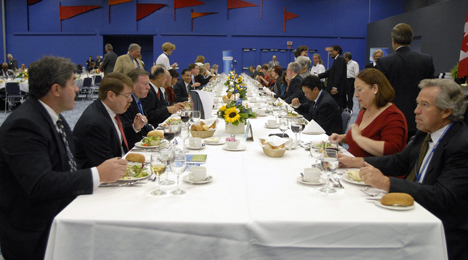 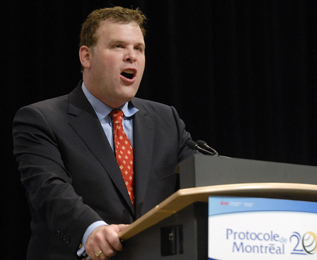 Canadian Environment Minister John Baird described the agreement as a historic achievement for ozone protection and the fight against global warming. 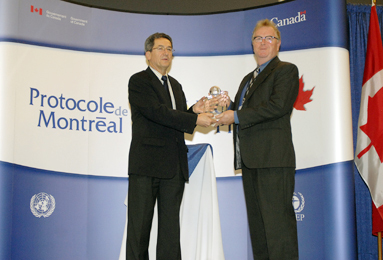 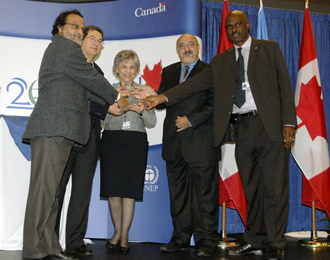 Green Customs Initiative received an award for their efforts to track trade in relevant substances (left) and Bruce Cox, Executive Director of Greenpeace Canada, receives the award for Greenpeace International.